The Abstract Window Toolkit (AWT) is Java's original platform-dependent windowing, graphics, and user-interface widget toolkit, preceding Swing. The AWT is part of the Java Foundation Classes (JFC) — the standard API for providing a graphical user interface (GUI) for a Java program. AWT is also the GUI toolkit for a number of Java ME profiles. For example, Connected Device Configuration profiles require Java runtimes on mobile telephones to support the Abstract Window Toolkit. When Sun Microsystems first released Java in 1995, AWT widgets provided a thin level of abstraction over the underlying native user-interface. For example, creating an AWT check box would cause AWT directly to call the underlying native subroutine that created a check box. However, a check box on Microsoft Windows is not exactly the same as a check box on Mac OS or on the various types of Unix. Some application developers prefer this model because it provides a high degree of fidelity to the underlying native windowing toolkit and seamless integration with native applications. In other words, a GUI program written using AWT looks like a native Microsoft Windows application when run on Windows, but the same program looks like a native Apple Macintosh application when run on a Mac, etc. However, some application developers dislike this model because they prefer their applications to look exactly the same on every platform. In J2SE 1.2, the Swing toolkit largely superseded the AWT's widgets. In addition to providing a richer set of UI widgets, Swing draws its own widgets (by using Java 2D to call into low-level subroutines in the local graphics subsystem) instead of relying on the operating system's high-level user interface module. Swing provides the option of using either the native platform's "look and feel" or a cross-platform look and feel (the "Java Look and Feel") that looks the same on all windowing systems. A java.awt.datatransfer package for use with the Clipboard and Drag and Drop. 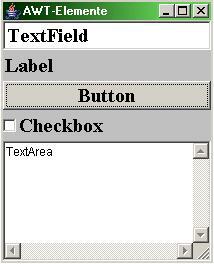 A basic set of GUI widgets such as buttons, text boxes, and menus. It also provides the AWT Native Interface, which enables rendering libraries compiled to native code to draw directly to an AWT Canvas object drawing surface. The ability to launch some desktop applications such as web browsers and email clients from a Java application. Neither AWT nor Swing are inherently thread safe. Therefore, code that updates the GUI or processes events should execute on the Event dispatching thread. Failure to do so may result in a deadlock or race condition. To address this problem, a utility class called SwingWorker allows applications to perform time-consuming tasks following user-interaction events in the event dispatching thread. Prior to Java 6 Update 12, mixing Swing components and basic AWT widgets often resulted in undesired side effects, with AWT widgets appearing on top of the Swing widgets regardless of their defined z-order. This problem was because the rendering architecture of the two widget toolkits was very different, despite Swing borrowing heavyweight top containers from AWT. Starting in Java 6 Update 12, it is possible to mix Swing and AWT widgets without having z-order problems. As the AWT is a bridge to the underlying native user-interface, its implementation on a new operating system may involve a lot of work, especially if it involves any of the AWT GUI widgets, because each of them requires that its native peers be developed from scratch. A new project, Caciocavallo, has been created, that provides an OpenJDK-based Java API to ease AWT implementation on new systems. The project has successfully implemented AWT widgets using Java2D. All the necessary core-JDK modifications have since been pushed to OpenJDK 7, which means that Java can now be used on a graphics stack other than one of those provided by the official JDK (X Window System, OpenGL or DirectX), by including an external library and setting some system properties. A DirectFB backend for Caciocavallo is under development, as is an HTML5 backend; the aim is to deploy existing Swing applications—without Java support—as ordinary web applications running on a web server. ^ Fowler, Amy (1994). "Mixing heavy and light components". Sun Microsystems. Archived from the original on 1 May 2012. Retrieved 17 December 2008. ^ "Bug/RFE fixed in current JDK 6u12 build". Sun Microsystems. 12 December 2008. Archived from the original on 17 December 2008. Retrieved 17 December 2008. ^ Torre, Mario (2 March 2008). "FINAL PROPOSAL: Portable GUI backends". Archived from the original on 1 May 2012. Retrieved 7 September 2008. ^ Kennke, Roman (18 December 2008). "Caciocavallo Architecture Overview". Retrieved 7 September 2008. ^ Kennke, Roman (3 September 2008). "Cacio Swing AWT peers". Archived from the original on 29 April 2013. Retrieved 7 September 2008. ^ "How much has been pushed upstream?". openjdk.java.net. 20 September 2009. Archived from the original on 1 May 2012. Retrieved 7 March 2010. You don't need anymore those patches, with the latest FontManager push, everything is upstream now, so just use the Cacio repo, it's completely self contained. ^ a b Kennke, Roman (28 July 2011). "JDK7 and Cacio coolness". Retrieved 8 August 2011. ^ Eisserer, Clemens. "HTML5/Canvas backend for Caciocavallo (GNU-Classpath)". Archived from the original on 10 August 2011. Retrieved 8 August 2011. Wikimedia Commons has media related to AWT.